TestEvidence has significantly improved our test execution speed and test quality. It isn’t often that a tool provides both speed and quality improvements. To provide evidence that something complies with regulatory requirements. Typically our clients record the manual execution of a test plan and then export this recording to a PDF that shows every action and automatically includes relevant screen shots. E.g. in the medical field it’s used to prove that tablet computers have been configured and tested in accordance with a compliance specification. To improve the efficiency of bug reporting from users/testers to developers. TestEvidence acts like a black box, constantly tracking user activity and retaining the previous few minutes of history. If a bug occurs the user can save this recording and pass it onto the development team without needing to write up what they thought they did and taking screen shots. Our customers report 50% to 70% efficiency gains here. To simplify documentation production by recording interactive sessions with a single application and then picking and choosing the automatically captured screen shots for the documentation. No manual screen capture or image cropping is required for this. Test Evidence Suite allows the tester to focus on the task of testing the software, not the task of evidence capture. 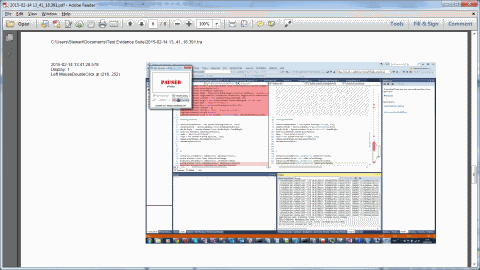 The TestReviewer is used to analyze recordings and prepare PDFs. Q: On average, how much time do you think TestEvidence saves you? A: On average capture would cost 10 minutes per test, based on the workflow of; Capture screen, paste to work, annotate, comment, save file. The minimum saved has been 50%, in truth this is nearly 70% as the tester only has to record, verify, export and save. The Test Evidence Suite comprises Microsoft Windows applications that run on any version of Windows from XP onwards. The Test Evidence Recorder integrates with Windows at the lowest level to allow the capture of user interaction even inside virtualized environments, such as mobile and tablet emulators and VMWare / VirtualBox hosted images. The Test Recorder is easy to use for end users and powerful enough for professional testers. Engender trust in your reporting with a full audit trail of user interaction that is automatically captured. No need to remember to take screenshots. Preserve the evidence for your customers or regulators through generated PDF, Word or RTF reports or archiving by the Test Evidence recordings. Compliance and Quality Assurance reporting are major drivers with customers in the medical, financial and engineering sectors. Customers in this field use Test Evidence to evidence the Operational Qualification (OQ) aspects of their TQM processes. Simplifying User Acceptance Testing (UAT) by using the "black box" continuous recording feature to provide developers with full user history and context to errors. Procedural conformance and Quality Assurance training by producing documents showing the approved way to perform tasks. Improving communication between development and end user teams. Supporting cross platform development by capturing activity inside the device emulators used by designers and developers. The Test Evidence Suite really helped smooth our issue reporting process. It assisted problem resolution with the offshore development team greatly.